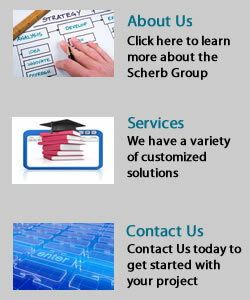 The Scherb Group is an established software solutions and IT consulting company, with a client list that contains all sizes and types of organizations from small companies to government institutions. Software written by The Scherb Group has been deployed in over 13 states, has been used to manage hundreds of thousands of student enrollments and manages millions of dollars of services for businesses each day. The Scherb Group, LLC is a Georgia-based, family-owned business. Our focus is on building and providing an atmosphere of trust with clients to deliver the best products and services possible. Our clients are lifelong—once we start working with a customer, our commitment to them and their business is absolute. If our customers thrive, our business thrives as well. Our customers invite us to their family picnics, exchange holiday gifts as friends, and share in the rewards of a hard day of work.